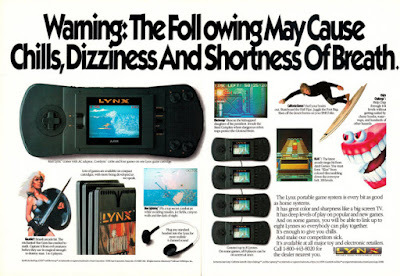 The Atari Lynx is a relatively obscure system that was released during the burst of hand-held gaming systems between 1989 and 1991. This included the Lynx, as well as Nintendo’s Game Boy, Sega’s Game Gear, and NEC’s TurboExpress. 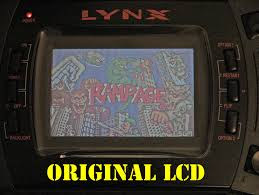 While the Game Boy was the value champ and the TurboExpress was the top performer for kids whose parents belonged to country clubs, the Lynx and Game Gear were both middle players which had similar orientations, screens and gaming performance. While they were a blast 30 years ago, by today’s standards, the backlit screens on these middle performers are dull and faded looking and not terribly efficient with batteries. Fortunately for fans of retro games, McWill offers a replacement screen mod for both systems which gives each unit a crisp and bright display. This is very helpful for those of use who grew up with these systems and who’s eyes are getting a little older. What else is getting older is the capacitors and power components in these units. Electrolytic capacitors from this time frame are not known for reliability and are likely ready to give up the ghost at a moment’s notice, bursting and oozing out onto the PCB and making restorations more involved. 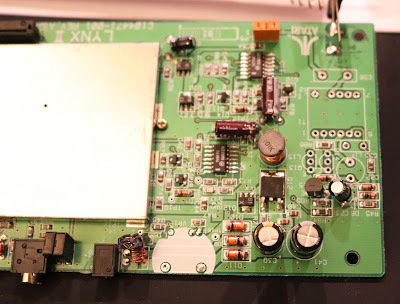 In addition, the Lynx has some silicon parts that handle the 9V to 5V regulation that need to be replaced too, otherwise if they fail, the motherboard can get fed 9V and that is enough to take it out of commission. Fortunately, these parts are available and cheap to replace, even with nice quality Japanese caps like Nichicon. What’s not cheap is the McWill mod, at $120 as of this writing, but if you’re a fan of these old systems it is totally worth it. Not only is it on the pricey side, but it takes some effort. You need to know how to handle SMD soldering (use tweezers, a fine point iron and lots of liquid flux). If you are not sure about soldering skills, you should not be handling these mods. There are several people out there that do the mod for what I consider to be very reasonable. As an example, I’m pretty methodical when soldering, but to replace the caps, power-related parts, and wire up the screen and VGA out takes a solid 8 hours. Granted if I did it again, I could get it down to 4-5, but there are people replacing screens on eBay for $200 with the $120 McWill mod included, and another $60 or so to replace the caps. I’d call that a solid deal if you’re not inclined to handle it yourself. I picked up the McWill Screen mod, a set of caps, and the power parts for about $130 from Console5. They host the instructions PDF as well. The two-page instructions on the McWill is decent but has a couple of head-scratchers that you’ll have to Google around to figure out. They could be better, but I’m sure this mod is a labor of love and McWill’s not getting rich from it… so just grin and bear it. Before getting started, I placed a paper towel over the screen and then covered the front of the unit with painters’ tape to protect it. 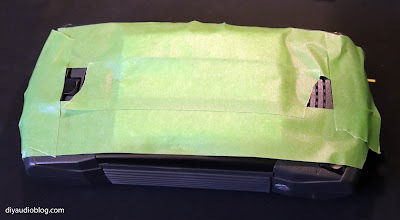 It doesn’t stick much so it won’t leave residue, and it protects the unit from getting scratched while you work on it. To get the unit open, there are five screws that need to come out, two under each of the rubber grips on the back, and one inside the battery compartment. 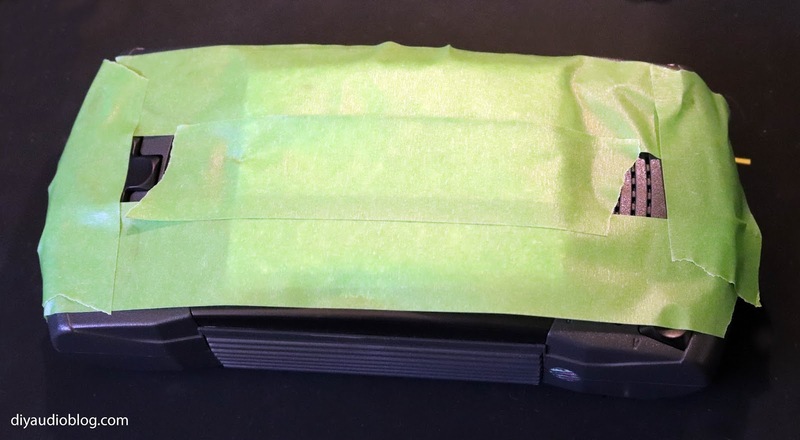 To get the rubber grips off, wedging a thin screwdriver underneath on one of the corners and gently rocking back and forth will help the adhesive give way. I’d recommend using foam or painters’ tape to protect where the screwdriver’s shaft touches the unit to avoid marring. Removing the back cover reveals the circuit board and all the little capacitors you will have to replace. These are pretty easy to handle, aside from the one sitting in the middle of the metal shield. 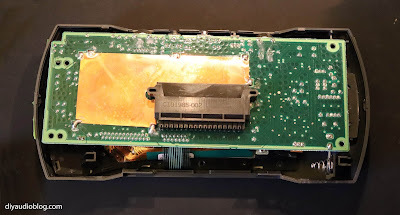 For that one, the copper shielding behind it must be partially removed so you have access to the solder joints underneath. 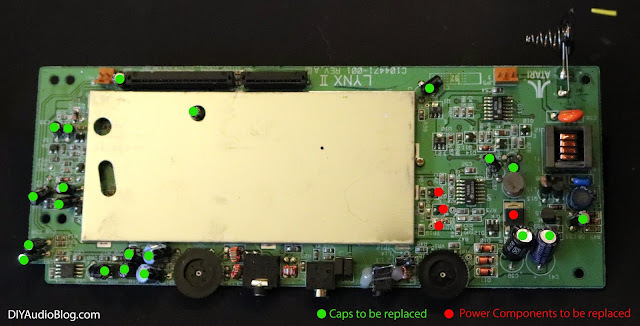 Once that cap is replaced, the joints need to be covered with dielectric (electrical tape / Kapton tape, etc.) so the copper shield doesn’t short it out. For the rest of the caps, simply heating the joints on the bottom of the PCB while pulling on the cap on the top of the PCB releases them fairly easily, then a solder sucker can be used to clear the eyelets on the board. One trick is you should NOT cut the leads until you try and reseat the back cover to confirm there is clearance. Some of the caps may touch the case or the speaker so they have to be leaned one way or another. 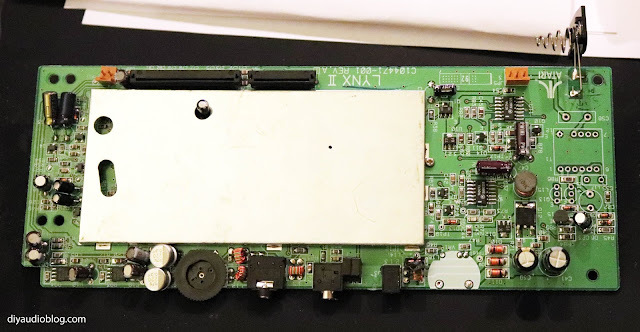 Based on the directions provided for the McWill, several parts which handled the old LCD need to be removed. You'll notice these are mostly on the right of the photo below. Fresh new capacitors installed and non-vital parts removed. The next objective is to replace the voltage regulator parts. This includes a Zener diode, MOSFET, two 3906 transistors and the power jack. The MOSFET is the largest part. I trimmed off the legs, then heated the metal backing behind the chip to get it to release. The existing jack is superglued down next to a teeny transformer, so be very careful when removing that glue not to damage it. The remaining parts are quite small and require SMD tools to install (tweezers, liquid flux, small solder tip, etc.). Below is the unit getting wired up. I like to use 24 gauge silver-clad copper wire with PTFE sleeving. It's nice high quality stuff and is pretty is to route. When wiring, you have to ensure you are considering how the screen will be oriented in relation to the main PCB so the wires aren't cut too short or too long. 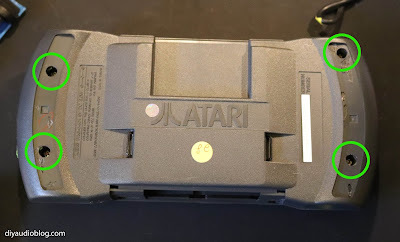 The VGA output installs where the brightness potentiometer used to be (you do need to dremel out some of the plastic so it will fit). It's a nice added feature that adds value to the McWill package. HDMI would be preferable, but that would add cost and complexity which may not be welcome for many modders. Once all that work is complete, you'll have yourself a beautifully performing Lynx system that will hopefully last another thirty years. The big question now... is all this worth the hassle? There are a number of us that like to play games on original hardware because emulators introduce annoyances like slowdown, sprite flickering, crashing, etc. 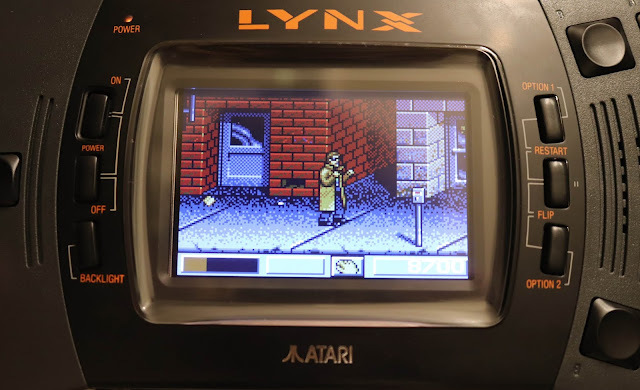 If you want to play Lynx games on original hardware, you have to replace the voltage regulation immediately or you'll be playing Russian roulette with a valuable piece of vintage gear, and really the capacitors all need to be replaced too. 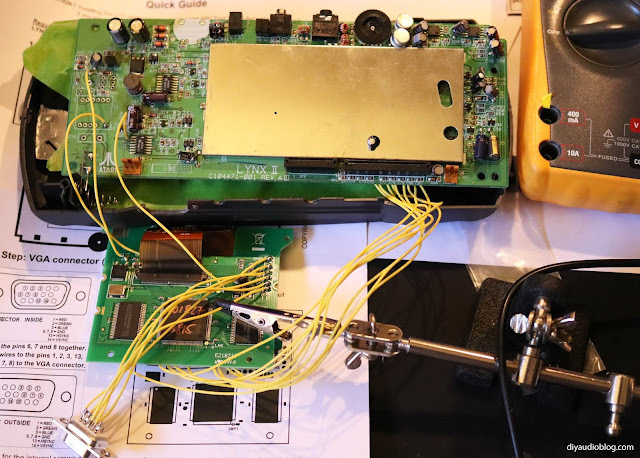 If you're already going to that effort, the McWill screen is a no-brainer given the improvements... just keep in mind that if you're not sure of your solder slinger skills, get someone else to handle it. The Fine Print: Please remember that building/modifying circuits can be dangerous to you and/or your surroundings and should only be performed by a certified technician. The owner of this blog and all associated parties can not / will not be held responsible if you attempt a build or modification posted above and cause physical harm to yourself and/or your surroundings.